Several "twinned bows" have been imaged, mostly during heavy showers, but currently there is no agreed explanation for them. They cannot be reflection bows because at the time most were imaged, the reflection bow from a horizontal water sheet would be in quite a different position. They mostly do not resemble supernumerary bows and attempts to model them with Mie or Airy scattering models using spherical water drop populations fail. They might form from a mixture of water drops and ice spheres. Although diffuse ice-sphere bows might occur, ice balls of the required sphericity and optical quality to produce the observed sharp twinned bows are unlikely. A twinned secondary should also then be observed and so far it has not. A stronger possibility is that non-spherical raindrops produce one or both bows. Surface tension forces keep small raindrops fiercely spherical but as they fall large drops are flattened by air resistance or might even oscillate between flattened and elongated spheroids. Numerical ray tracing by BowSim shows that departures from sphericity by a mere 1-2% noticeably distort the primary bow. We have to marvel that rainbows are ever seen! The BowSim computation at right is for a mixture of spherical drops and oblate spheroids that have their vertical axis shortened by 2.5%. This could for example be produced by two showers falling through an observer's rainbow cone, one of smaller spherical drops and the second of large drops flattened by air resistance. The lower bow is from the oblate spheroids. 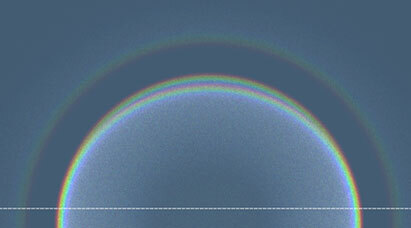 At the simulation solar altitude of 5º the secondary bow is undistorted. This example is not to suggest that oblate spheroids, merely convenient for the calculation, are required to make twinned bows but rather that twinned bows could be produced by some type of non-sphericity. We need more observations of twinned bows to better know their nature; close-up images at known focal lengths of the 'twins', wider angle images around the bow and if possible the secondary in order to measure the primary-secondary spacing and thus any departures from circularity, exposures to show the detailed structure of the secondary, all combined of course with the local weather conditions. 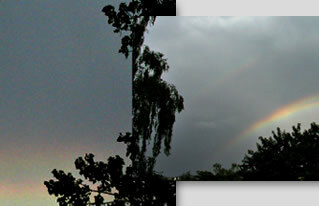 An anomalous "twinned" rainbow seen by Benjamin Kühne (site ) on 3rd June 2002. The primary appears to split into two equivalent bows. The inner bow does not at all resemble a supernumerary. Images ©2002 Benjamin Kühne, reproduced with permission.